A little, well not very little since I haven’t blogged in over a month, weekend update here. It’s been a busy last month or so and I really missed writing periodically. I decided this week that I really need to commit to finding time to share some of my thoughts (because you really wouldn’t want to read everything that goes on in my head in a given day) and activities here. In many ways, my blog has been a bit of a brain dump primarily focused on running and it feels good to have an outlet. So here’s to hopefully blogging more! –It’s been pretty busy at work. 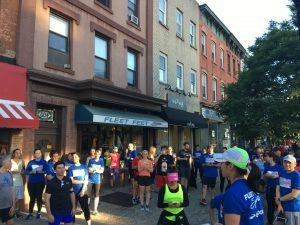 As I might have mentioned here before, I work part-time for Fleet Feet Sports Hoboken managing their events and marketing. I’m fortunate in that I can do most of my work from home and not on a set schedule. We’ve had a number of big events in the last couple of weeks and that has kept me pretty busy! We hosted a fun run on Global Running Day called The Big Run (in conjunction with Fleet Feet and Brooks Running) and it was so much fun! I loved meeting so many runners from all over the area. –We took a trip to Florida to visit Josh’s family at the end of May. Charlotte’s already been on 6 plane rides and she’s not even one yet. I have a feeling she will be quite the jetsetter like her parents. She had many firsts while in Florida including trips to Costco, Walmart, the pool and the library. As you can tell we don’t make it out much! –I am excited to announce that I am running the NYC Marathon with CaringKind’s Athletes to End Alzheimer’s team. This will be my fifth year involved with the team. It was a no-brainer when I decided to run the NYC Marathon again this year that I wanted to support CaringKind. CaringKind is formerly the Alzheimer’s Association, NYC Chapter and while the organization has undergone some changes in recent years, finding a cure and bringing awareness to Alzheimer’s Disease is still a cause very near and dear to my heart. Every bit helps, so if you’d like (and I’d be so greatly appreciative) to support CaringKind, you can donate on my race page. THANK YOU! –I brilliantly signed up for race a every weekend in the month of June. I don’t know what I was thinking. Between that and Charlotte’s swim lessons, I’m constantly on the go. I ran the Retro 5-Miler, New York Mini 10K, Queens 10K and was supposed to run this weekend’s Front Runners New York LGBT Pride 5-Miler (but I chickened out with the morning rain storm). It has been nice to get out there have a race for motivation every weekend but I am extremely sleepy once evening rolls around. –I also decided to work with a coach for my fall marathons. 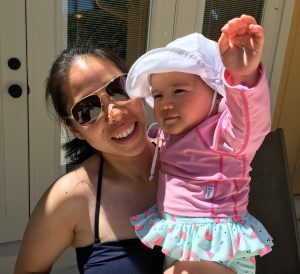 I coach occasionally from sprint triathlons to 5Ks, 10Ks, half and full marathons but after my attempt to “coach” myself for the LA Marathon this past winter, I knew that I needed a little more accountability and guidance. As a coach, at least in my opinion, it’s easier to coach others than yourself. I find that I am usually too critical or not critical enough of myself but with others I can be more objective and motivating. So far I’m three weeks into training for the Berlin and NYC Marathons with Jess at Race Pace Wellness. I’m really enjoying working with Jess. I can take my mind off of worrying about my workout for the day and just trust what she has prescribed for me. While I have had to move workouts around on a given day, knowing that I need to report back has really helped keep me motivated and accountable. I look forward to sharing how my training goes in the next couple of months. And with that is my weekend update of the last month or so! Now your turn, tell me how you’re doing and any fall marathon plans? 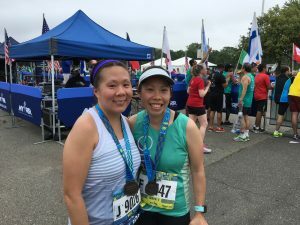 This entry was posted in 2017 Berlin Marathon, 2017 NYC Marathon, Alzheimer's Team, Florida, Global Running Day, marathon training, race, Race Pace Wellness, run, travel. Bookmark the permalink.